GROS ISLET, St Lucia, CMC – Ex-West Indies opener Devon Smith stroked a half-century as Windward Islands Volcanoes frustrated Trinidad and Tobago Red Force’s hopes of a victory on the final day of their fifth round match in the Regional First Class Championship here yesterday. Opener Devon Smith struck a defiant 56 to ensure a drawn game. Trailing by 76 on first innings and starting the day on two without loss, Volcanoes had reached 198 for eight in their second innings when the two teams shook hands, with an hour left in the contest and the hosts already 122 runs ahead. The drawn game gave Volcanoes six points while Red Force took seven points. The left-handed Smith played a key role in ensuring the stalemate, stroking 56 and receiving support from Shane Shillingford who got 34, Andre Fletcher who scored 29 and Kevin McClean who chipped in with 24. Part-time off-spinner Narsingh Deonarine (2-27), leg-spinner Imran Khan (2-38) and left-arm spinner Akeal Hosein (2-84) all finished with two wickets . Red Force started the day hoping to trigger a Volcanoes collapse and even though the hosts lost early wickets, Smith held the innings together with a responsible knock. 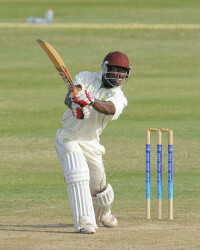 Tyrone Theophile fell in the day’s fourth over for one, caught at second slip by Yannic Cariah off pacer Marlon Richards with the score on seven. Richards then removed Miles Bascombe four overs later, caught at the wicket for 21 and when West Indies limited overs batsman Johnson Charles perished for seven, stumped by Steven Katwaroo at 42 for three, the Red Force looked like forcing a win. However, Smith buckled down to deny the visitors, in an innings that spanned 186 balls and nearly 3-1/2 hours, with three boundaries. He put on 43 for the fourth wicket with Fletcher and another 33 with captain Liam Sebastien (18) for the fifth wicket, as Volcanoes reached lunch on 82 for three. By the time Smith was sixth out with tea approaching, the job of making Volcanoes safe was virtually complete but Shillingford smacked four sixes in a 94-ball knock, just to make sure. Fall of wickets: 1-7, 2-33, 3-42, 4-85, 5-118, 6-149, 7-183, 8-198. Bowling: Deonarine 16-5-27-2, Hosein 30-7-84-2, Uthman Mohammed 5-2-23-0, Richards 6-1-17-2, J Mohammed 3-0-6-0, Imran Khan 19.4-6-38-2, Y Ottley 1-0-1-0, Solozano 1-0-1-0. Points: Volcanoes 6, Red Force 7. Umpires: Nigel Duguid, Patrick Gustard.